The family bond of a blackbear and cubs is delightfully detailed in the artwork. These artists bears are a welcome addition to any bear collection. 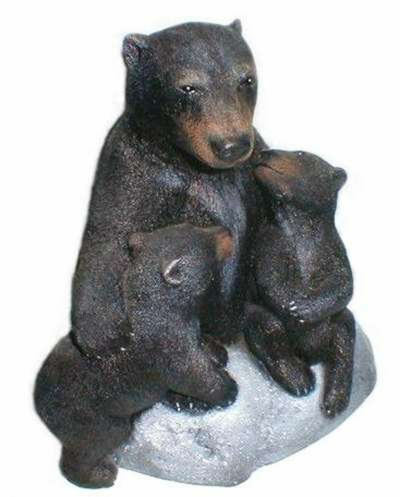 Black Bear Hugs is a realistic, limited edition sculpture of only 950 by Chris Dixon. Also available as unique editions of Brown and Polar bear and cub hugs. Get your limited edition black bears from the woods today. The artwork is cast with hand painting to a very natural look. "Cast Stone", a unique artist's blend of durable, high strength and nontoxic artists' materials. The black bear weighs from 130 to 400 pounds and approximately 5 feet. Maturing in 4 - 5 years and breeding every 2 to 3 years usually in May - June. In January or February the bear cubs are born, frequently twins, with each only 3/4 of a pound at birth. Hair color varies highly from blond to rust and the usual black. The intelligent black bear has learned how to survive and adapt. Black bears are opportunistic omnivorous feeders. Historically uncontrolled harvest was encouraged by state-paid-for bounties on bears as late as 1977. Habitat encroachment by timber, clearing of land for agriculture and human population were traditionally detrimental to the numbers of bears. A major threat to the American black bear, grizzly and polar bears is widespread poaching to supply overpriced Asian markets with bear gall bladders and paws ( considered to have socio-medical value in China, Korea and Japan ). The Convention on International Trade in Endangered Species of Wild Fauna and Flora (also known as CITES), a treaty among more than 120 nations, provides measures to curb illegal trade in wildlife and wildlife products across international boundaries, helping to protect the black bear. The Louisiana black bear and the Florida black bear are still disappearing mostly due to habitat degradation and loss. The US Fish and Wildlife Service listed the Louisiana black bear as a threatened species in 1992 The American black bear also is protected in the affected states ( Texas, Louisiana, and Mississippi ). The Florida black bear is also a candidate for protection under the Endangered Species Act.